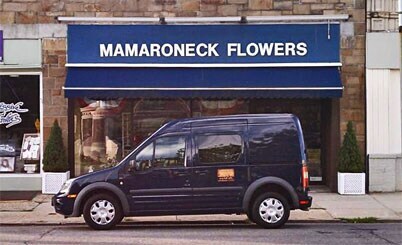 Mamaroneck Flowers has been proudly serving since the community since 1970. We are family owned and operated with one location serving on the Boston Post Road serving the Westchester area. We are committed to offering the freshest, finest florals around the world, individually designed and created by our award winning floral designers. Every individual customer can expect the very best unique and creative floral arrangement. Let Mamaroneck Flowers go the extra mile for you. Languages Spoken : Spanish, French, Italian, & Greek. We deliver daily to Mamaroneck, Harrison, Larchmont, Rye, and White Plains, New York. Our shop is open from 9:00 a.m. to 5:00 p.m., Monday through Saturday. We are closed on Sunday. Our shop will always be closed on the following holidays: Christmas, New Year’s Day, Memorial Day and Independence Day. If you have any questions or need more information, please contact us by calling us directly at (914)698-2585. We're always here to serve you and make your flower-sending experience a pleasure. A local delivery fee of $8.00 will be added to each order, for each address. (For deliveries outside our local delivery area, this fee may vary.) U.S. orders must be received before 12:00 noon in the recipient's time zone to assure same-day delivery. Orders received after that time will be delivered the following day. We will do our best to accommodate deliveries at specific times of day, but we cannot guarantee it.